Ultra slim fibre optics splicer with cleaver, stripper and accessories. Removable battery, with a life for up to 300 splicings. 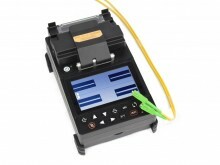 The ultra slim fibre optics fusion splicer model PROLITE-42 meets the highest quality requirements. It is the perfect design for the installation and maintenance of any type of optical fibre network, specially for FTTH installers. It features a battery life for up to 300 splicings with a single charge, with automatic core fibre alignment and up to 300x on-screen magnification. The fusion splicer can be both battery operated and also connected to the mains. The PROLITE-42 is delivered into its own rugged transport case, that also includes all the necessary tools to immediately work with optical fibre: Cleaver, stripper, fusion protection sleeves, cooling tray and spare electrodes. Click the button below to add the Promax PROLITE-42 Ultra Slim Fibre Optic Fusion Splicer to your wish list.